Here you will find an overview of our test facilities for room air distribution technology. In principle, all of the facilities listed below are also suitable for measuring air-water systems. In the laboratories, measurements are performed to determine the technical basic data for all types of air terminal devices in accordance with EN 12238 and EN 12239 in order to create catalogue data. Moreover, comfort data are determined in accordance with ISO 7730 in rooms equipped with air terminal devices, chilled ceilings as well as passive and active chilled beams. The catalogue data for air-water systems are determined in the test rig according to EN 14240. 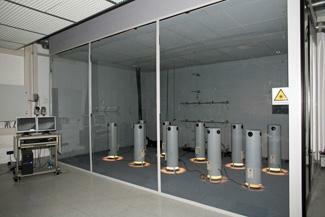 An acoustic test of air conditioning components takes place in the TROX acoustics laboratory. Simulation of outside facade influences thanks to a separate climate chamber at a front wall. Stirnwand. Possible temperatures -10°C to 40°C / 10% to 90% rel. humidity.